The Requirements UI (User Interface) is the common UI used to configure steps, points type awards and deducts and rank requirements. This indicator will appear when any requirement field has changed and this change hasn’t been saved. Clicking on the save all button will remove all indicators placed. This control will toggle the availability of the requirement. When a requirement is disabled will not take in count by the awards engine. It means that if you have an achievement that requires 2 steps, disabling one of them will make the achievement unlockable by completing 1 step (the enabled one). This functionality could be useful to quickly enable/disable points awards and deducts temporaly. Note: Requirements disabled will not be shown at frontend. This will duplicate the requirement into a new one with the same configuration. This button will delete permanently the requirement. You can reorder the requirements by just drag and drop them. This order will be applied at frontend when the requirements are shown. Important: The order you set to steps and rank requirements is really important when you make them sequential and it’s explained below. Every requirement has a set of fields that will let you configure it. There is an explanation of the common fields to almost every requirement, but depending of the event you set some fields could be added or removed. For example GamiPress – Social Share events adds in some events the social network field. The event is the most important field of a requirement. It defines the action an user needs to perform to achieve this requirement. You can check the list of built-in events. Some add-ons (and much more our integrations) will add new events. This is a common field present on all “specific” events. GamiPress normally offers a generic event (Comment on any post) and a specific event (Comment on a specific post). This field will let you to configure to which post is the user restricted. 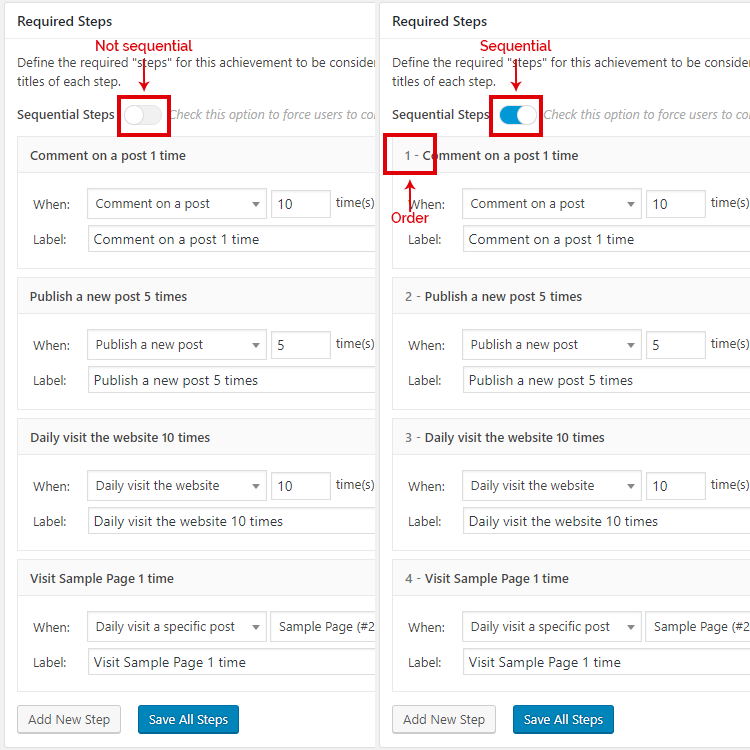 If you set the event “Comment on a specific post” and you set the “Sample Page” as attached post, to achieve this requirement user will need to comment specifically on “Sample Page”, comments in other pages will not take in count to achieve this one. 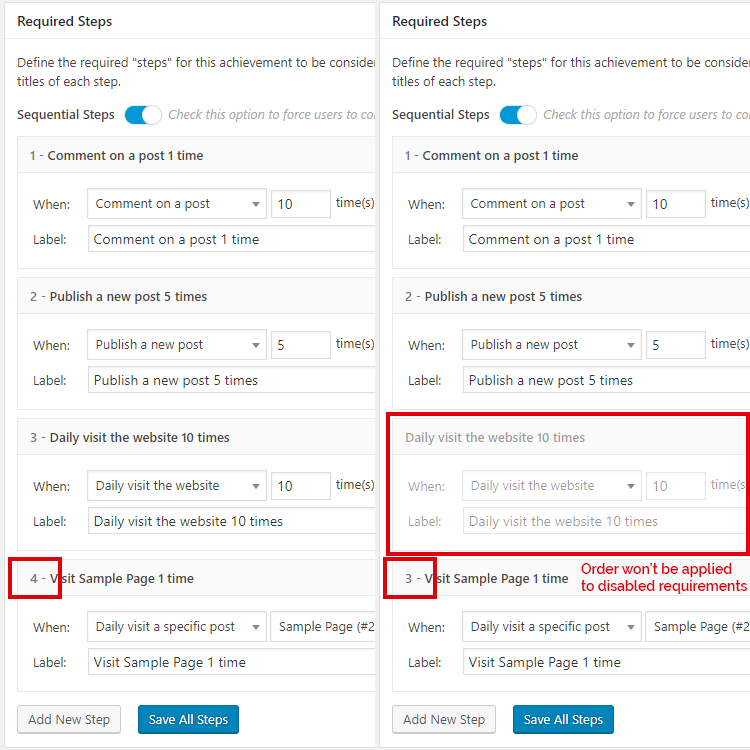 Note: Some times you will be noticed that specific events are related to “posts” but this not means that it will work just for WordPress “posts” (blog entries). WordPress offers the ability to register as many post types as you want, for example, WooCommerce register a post type named “product”. Our “Comment on a specific post” event will let you to set as attached post any post that his post type has support for comments. This field will define the number of times an user needs to perform the action to achieve this requirement. If you set the event “Comment on any post” and you set this field to 5, will require to the user to comment 5 times on any post to achieve it. There is a set of fields to define requirement achieve limitations. By default all requirements are set to “Unlimited” but changing its value will show to you a new field to set the time limitation of this requirement. The available time limitations options are: Unlimited, Per Day, Per Week, Per Month and Per Year. The text that will be shown at frontend. Important: When label is empty, GamiPress will auto-generate it based on the requirement setup. If label has any content, then GamiPress won’t generate it. In addition, you can check the tutorial about how the awards engine works that will help you to understand how to configure requirements applying time limits with a few real world examples. When editing points awards and deducts you will see a new line with two fields letting you to configure the amount of points that will be awarded or deducted as well as the maximum number of times that can be earned or deducted. You can reorder the requirements by drag and drop them. Also, it will affect the way an user can earn the achievement or rank. 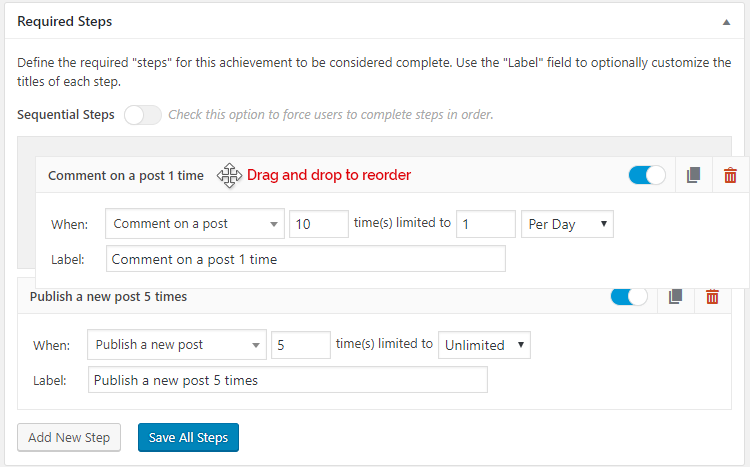 User will need first publish 5 posts and before comment on a post to earn the achievement. Sometimes the sequential order of requirements can has a great importance depending of the events configured. A common requirements to an achievement for authors will be publish their first post and before get comments on their posts.